Genus: Philodromus Walckenaer, 1826. 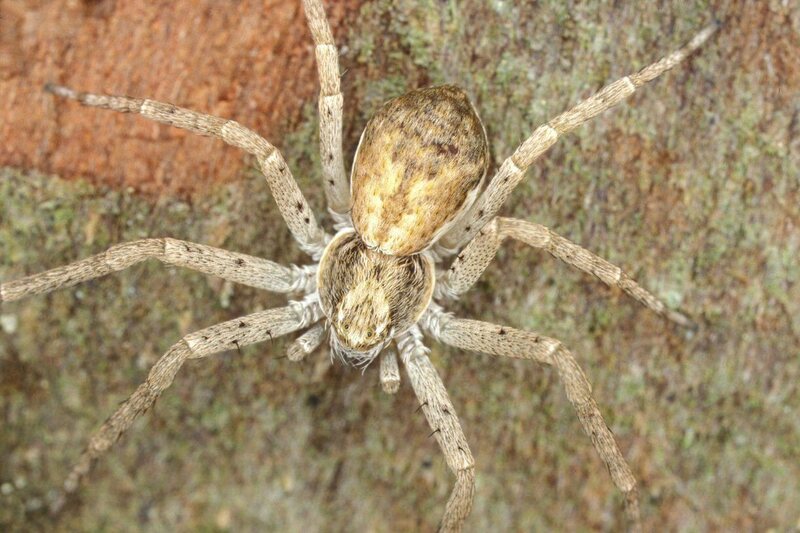 Characters of genus: The spiders of this genus have flattened bodies, and latigrade legs that often are held very close to the substrate such as all segments appear as being in the same plane. Most species have relatively short abdomens, only slightly longer than broad and with the widest point behind midway. In this respect they resemble many species of the Thomisidae. The posterior row of eyes is recurved and the distance between the medial eyes is about 1.5 times the distance between a median and a lateral eye. Most species live on plants on which they are able to move around rapidly, their flat bodies enable them to hide under bark. Some species are extremely well camouflaged and almost impossible to spot unless they move. Other species are qiute conspiceous even when motionless. Family: Philodromidae Thorell, 1870 (Running Crab Spiders). Characters of family: The philodromids belong to the group of araneomorph, ecribellate spider families having 8 eyes and 2 tarsal claws. The eyes are not situated on tubercles. In many species they are fairly equal in size, however in some species all eyes of the anterior row or just the anterior medials are larger. The eyes are arranged in two recurved rows of four with the posterior row sometimes more strongly recurved than the anterior row. All legs are of about the same lengths or legs II alone longer (twice as long in Ebo). The legs are laterigrade so that the morphologically dorsal surface is rotated about one quarter of a turn to a posterior position. Tarsi I and II are provided with scopulae and claw tufts composed of spatulate hairs (thickest point on the distal half). The anterior tibia are sometimes provided with a row of long spines. Other diagnostics characters which separate philodromids from the related thomisids and sparassids include the lack of a colulus and the absence of tapetum in the secondary eyes. The carapace is as long as wide or elongate, rather flattened usually with fovea absent. It is densely clothed in recumbent plumiform or spatulate hairs. The carapace is frequently marked by a lighter longitudinal band of about the same width as the eye rows. The sternum is oval corresponding with carapace form, apex blunt between coxa IV. The cheliceral fang furrow usually has no teeth. The labium is longer than wide. Endites are longer than labium and converge in front. The female palp has a small toothed claw. The shape of the abdomen is oval, in some species slightly longer than wide, in others quite elongate. In most species the widest point of the abdomen is found in the rear half. It is densely covered with recumbent hairs and sparsely covered with longer, erect hairs. The cardiac mark is darker than the surrounding abdomen, sometimes very distinctive as in e.g. Thanatus. It may be followed by a series of chevrons. The spinners are simple. The tracheal spiracle is situated close to the spinners. The epigyne is usually small having a median septum. The male palp is furnished with a tibial apophysis; the shape of which is important when identifying to species level using the stereomicroscope.